'Writing a love story is a lot easier than living one.' So reads the tag line on the cover of The Bit in Between, a novel that sits somewhere on the spectrum of modern romantic comedies. 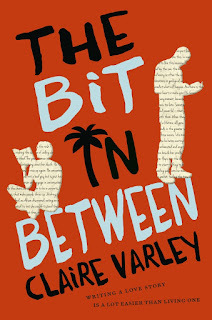 Like 2013's phenomenal breakaway bestseller The Rosie Project, The Bit in Between is an insightful exploration of the ups and downs of the modern relationship, and follows two twenty-somethings just trying to find their way. The writer referred to is Oliver, a Greek-Australian whose first novel was published to critical acclaim but with an ending he felt lacked literary integrity. After a trip to Greece to visit family and work on his second novel takes a tragi-comic turn, he returns home. In the airport in Malaysia, he meets Alison, herself returning from a failed romantic experiment in China with a dreamy but self-absorbed poet. Their meet-cute is anything but; as they wait for their plane to board, Alison vomits violently all over Oliver, thus proving that eating the sun-dried tomatoes you're not allowed to take on the plane is not the best method of disposing of them. The bit at the beginning, as it is called, does not get off the ground so well. And yet, over the course of a few hours (the duration of their flight) Oliver and Alison find a connection, and by the time they have landed in Melbourne, they have the potential to be more than friends. This potential takes them to the Solomon Islands, where Oliver intends to write a novel about the Island's independence from colonialism, and Alison must find something to do other than tag along. As Alison begins to find her purpose and the words on the page begin to take shape, something bizarre appears to take place; the things that Oliver writes have echoes in the real world. Can he control the world around him by writing about it? And should he? Claire Varley's debut novel has the potential to be a great holiday read, but below the surface of this unusual love story, there are complicated ideas at work. Through the character of Alison, Varley explores ideas about women, and cultural differences between Australia and the Solomons, Through Oliver's writing, she investigates the transition that the Islands and their people have undergone since they ceased to be a colony; and yet she does all of this without shoving a history lesson down the reader's throat. Her setting is a triumph, with all five senses at play in her overseas scenes. One idiosyncrasy of the novel which I failed to understand was the technique of head hopping after a new character was introduced. For even transient characters who would not be visited again, the narrative took a short pause in which a paragraph or two was inserted, telling that character's own love story. This seemed a little unnecessary, and interrupted the flow of the narrative. Perhaps this was an attempt to showcase the many and varied kinds of love stories that exist in the real world, but the narrative didn't need it. However, I think this novel was saved by its unconventional ending which allowed the reader to participate actively in how they wanted things to end, and ending which I think even a pessimist and perfectionist like Oliver could be pleased with. This is not your average romance, and it has many things to recommend it to readers of all genders and ages. It is a quick read, but as engaging and informative as you want it to be, which is exactly what I needed.